Cryogenic offers mains powered and optionally battery powered liquid helium level gauges to both measure and control liquid helium levels. 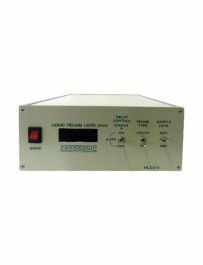 HLG200: The front panel features a self-ranging 3 digit LED display, 0 to 1100mm (1mm resolution). Switches are provided for on/off, probe type and pulse interval. HLG210: Similar to the HLG200 but offers additional control features. There are three internally adjustable pre-set levels, easily set by reference to the display. Two drive a 2-pole change-over relay for power switching (e.g. ; to drive solenoid valves in auto refill systems). The third provides a reference point, or can provide output to a persistent mode switch or audio /visual alarm. Standard probes consist of a superconducting element contained in a ventilated 2.1mm diameter stainless steel tube. The tube is terminated at the room temperature end with a 28mm long cap and 7 pin connector. Our superconducting level probes can be made in any combinations of total length and active length where the total length is at least 50mm less than the active length. There is a maximum individual active length of 1500mm, but two adjacent active lengths may be mounted in the same probe and switched by the front panel selector on the HLG gauge box. Two rigid vertical legs each 1200 mm long (*), 12mm outer diameter. Flexible horizontal span of 1177 mm overall of which 800mm is flexible. The syphon is made in two parts which join with a shielded coupling. The total horizontal span is 1425 mm long of which 800 mm is flexible. The bending radius of the flexible portion limits the maximum offset between the two legs to approximately 450mm. On the cryostat side, the bottom of the siphon leg will mate with the cone inside the cryostat at the level of the helium reservoir. (*) Custom length legs can be made for either standard model at a slightly increased cost depending on requirements.